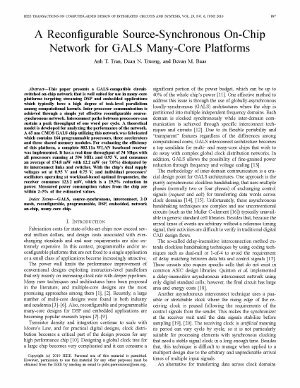 This paper presents a GALS-compatible circuit-switched on-chip network that is well suited for use in many-core platforms targeting streaming DSP and embedded applications which typically have a high degree of task-level parallelism among computational kernels. Inter-processor communication is achieved through a simple yet effective reconfigurable source-synchronous network. Interconnect paths between processors can sustain a peak throughput of one word per cycle. A theoretical model is developed for analyzing the performance of the network. A 65 nm CMOS GALS chip utilizing this network was fabricated which contains 164 programmable processors, three accelerators and three shared memory modules. For evaluating the efficiency of this platform, a complete 802.11a WLAN baseband receiver was implemented. It has a real-time throughput of 54 Mbps with all processors running at 594 MHz and 0.95 V, and consumes an average of 174.8 mW with 12.2 mW (or 7.0%) dissipated by its interconnect links and switches. With the chip's dual supply voltages set at 0.95 V and 0.75 V, and individual processors' oscillators operating at workload-based optimal frequencies, the receiver consumes 123.2 mW, which is a 29.5% reduction in power. Measured power consumption values from the chip are within 2–5% of the estimated values.